SHOCKS AND SPRINGS REPLACEMENT DIY. 2. Jack up one side of car, I started on the passenger side. Jack up car high enough to fit jack stands. Note if you have a floor jack at this point you can jack up the center of the car. 3. Fit jack stands under rear mounting point for control arm. It is a big circular aluminum part with a rubber insert and the control arm going into it. Note if you have a floor jack use the stock jacking points for the jack stands. 4. Jack up other side of car and fit jack stand in the same location. 5. Finish loosening the lug bolts and remove the wheels from both sides. 6. If you have xenon headlights start by disconnecting the xenon headlight-leveling sensor. 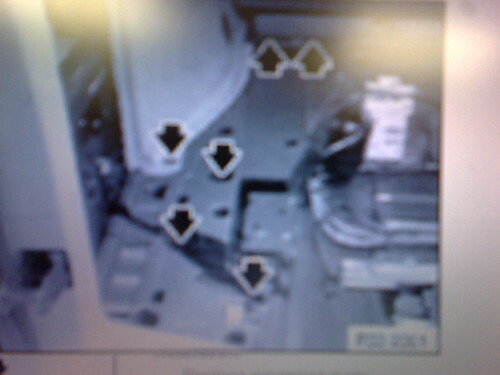 The xenon-leveling sensor is the most common part broken while installing springs, to eliminate this risk I disconnected it. 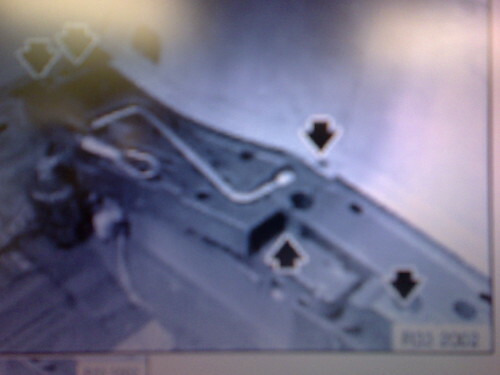 The sensor is located on the passenger side behind the shock and sway bar end link. 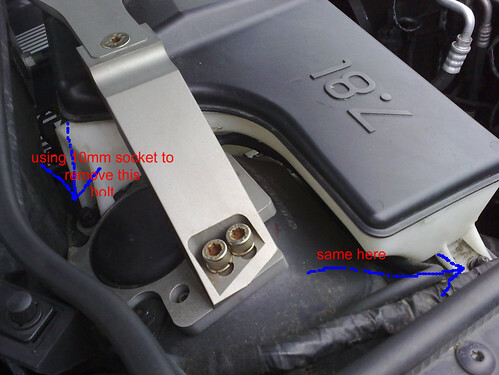 Use the open end of a 10mm box wrench to hold the backside of the sensor bolt. Use a 10mm socket to take of the nut. With the nut removed carefully pull the connecting link out of the black plastic sensor arm. Swing the sensor arm up and out of the way. The goal is to remove the entire shock and spring assembly as a unit, to do this it needs to be disconnected at three points. The top, in the engine bay, the bottom at the control arm, and in the middle where the sway bar endlink connects. 7. The sway bar endlink is the first to come off. Use the open end of a 19mm box wrench to hold the backside of the endlink bolt, use a 18mm socket to take off the nut. 8. Pull the end link out of the shock mount point and push to inside of fender so it is out of the way. 9. Disconnect the shock from the control arm next, this is much easier than disconnecting the top of the shock spring unit. Use a 18mm socket and an extension to give yourself a little room to work. The lower bolt also holds the bracket for the brake lines, brake pad sensor (depending on the side) wire, and I believe the ABS sensor wire. This bolt is one with about 220 ft-lbs of force so it may take some wrenching to get off, if the car is older it may be necessary to get a breaker bar. 10. Remove the bolt being careful to support the control arm. The control arm has the rotor and the caliper attached to it so it is quite heavy, having someone hold the control arm may help while you remove the bolt. To get the shock free of the control arm it may require some wiggling for the control arm. Once the control arm is free rest it on something (I used some beer boxes) so that there is not tension on the brake lines. When removing and reinstalling the shock/spring unit be careful not to snag the brake line. 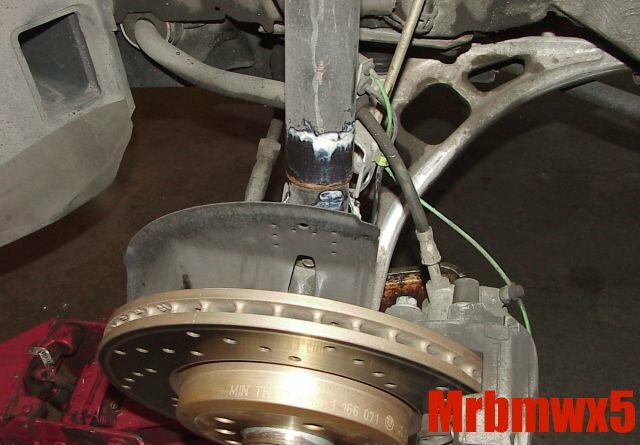 Do not allow the brake lines to be pulled on or stretched, this could cause them to fail. 11. The shock and spring unit should now be hanging by the top. 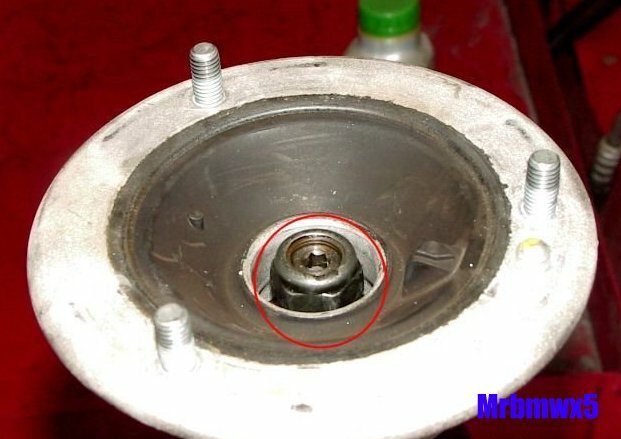 Remove the three top nuts from the shock/spring unit with a 13mm socket. Have a helper hold up the shock/spring unit so that it does not fall. 12. With the top nuts removed you should be able to pull the entire unit out. 13. 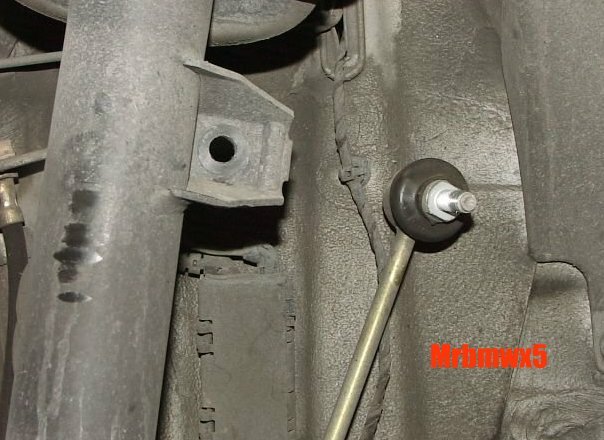 Repeat steps for driver's side of car, there is not a leveling sensor on the driver's side. At this point you should have both shock/spring units out. My recommendation is to do the next steps away from the car. Compressing the springs takes some work and having room to maneuver around is nice. Also if something goes wrong and a spring goes flying it will not hit the car. If working outside a small piece of carpet is nice to work on. Not having to hold the shock/spring unit up makes the install much easier. The carpet will protect the shocks and springs from getting hacked up on the payment. To remove the springs they must be fully compressed so when the top holder part for the spring, know as the hat is taken off there is no pressure on it. 14. Hook up the spring compressors making sure that the two parts on opposite sides of the spring otherwise it might slip off. The stock springs do not have that many coils so one side you can get 3 coils in the compressor and the other side will only have two. The spring will not be compressed completely even but it will still work. 15. Take an even number of turns on each side of the compress until the spring is not putting pressure on the hat. 16. Remove the cap that covers the nut on the hat. Using a 22mm socket loosen the nut on the hat, check the number of turns left on the nut, the nut should be loose enough to be removed by hand, if not there still may be pressure from the spring on it. 17. Remove the hat, and the washer from the top of the shock. 18. Remove the spring still compressed from the shock and place the shock aside. 19. Decompress the stock spring by taking even turns off each side of the spring compressor. Once the spring compressor is loose remove them and place them aside. Set the stock spring next to your new springs and laugh at how much shorter they are. 20. Compress new springs with the spring compressors; this is much easier because the new springs have more coils so the number of coils can be even for both spring compressors. 21. The new springs are shorter so they take less compressing, check by fitting the shock through the spring. Make sure you put the springs on the right way; if the springs have lettering the letters should be right side up. 22. Once the springs are compressed enough test fitting the hat, to do this it helps to set the shock standing on end. To get the spring properly seated takes a little bit of maneuvering. The spring needs to be seated properly otherwise bad things will happen. The hat and the shock body both have notches where the end of the spring is supposed to sit. The springs should be tight in the notch on both the top and the bottom. 23. Tighten the nut that holds the hat. 24. With the spring properly seated in the notches and the hat bolted on start uncompressing the spring. Make sure that the springs stay seated in the notches; otherwise you will have to recompress the springs and do it over again. 25. 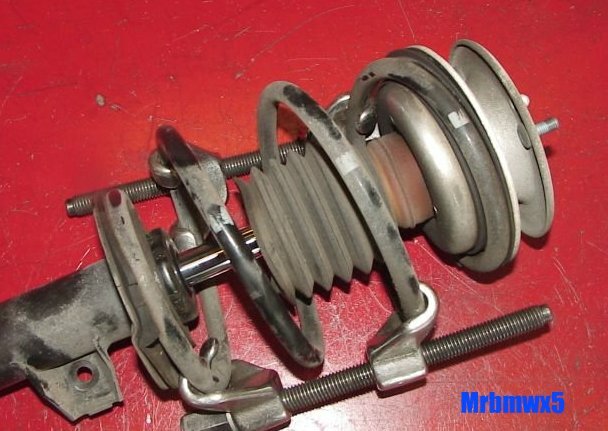 Once the spring is uncompressed remove the spring compressors and look at the now complete shock and spring assembly. 26. Repeat the steps for the other side. 27. 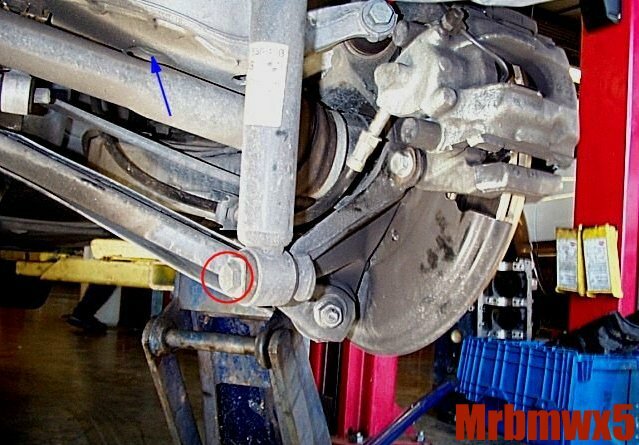 Reinstall the shock and spring unit in the car; you should be able to figure out the left and right by the sway bar mounting points. 28. The shock bodies have small pegs on the bottom that line up with the notch in the control arm. Push the control arm up onto the shock body until it cannot go any further. A jack or a strong friend is helpful when trying to reconnect the control arm. 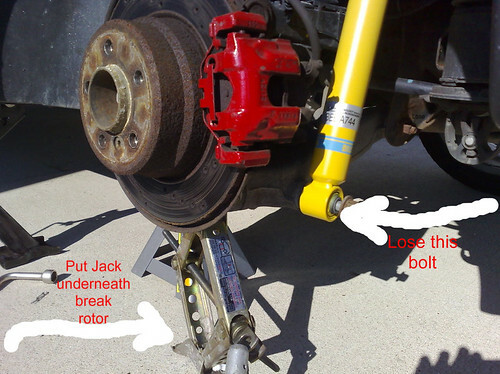 If you are using a jack place it under the control arm and use it to jack the control arm into place. 29. Remember to reconnect the xenon-leveling sensor once everything else is bolted up. 30. 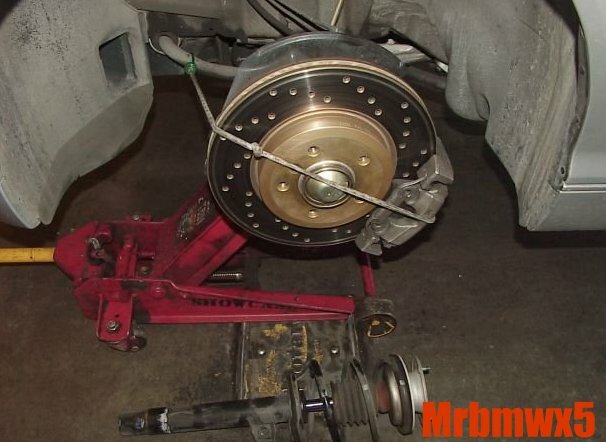 Put on the wheels and snug up the lug bolts, fully tighten the lugs when the car is on the ground. 31. Raise the car with the jack and pull out the jack stands. Now stand back and admire how much lower the front of the car is, then remember the back still has to be done. CAUTION! FOR THE REAR DISCONECT FUSE IN AIR SUPPLY SYSTEM SO THAT THERE IS NO UNINTENTIONAL SYSTEM REGULATION. Release nuts and expantion rivets. 34. Jack up the rear of the car, if you are using the stock jacks it is a little bit tricky because there is not a good place. I placed a single jack stand in the center, under the differential, and used two jacks on either side. 35. Disconnect the shock from the controlling arm using a 22mm socket. 36. 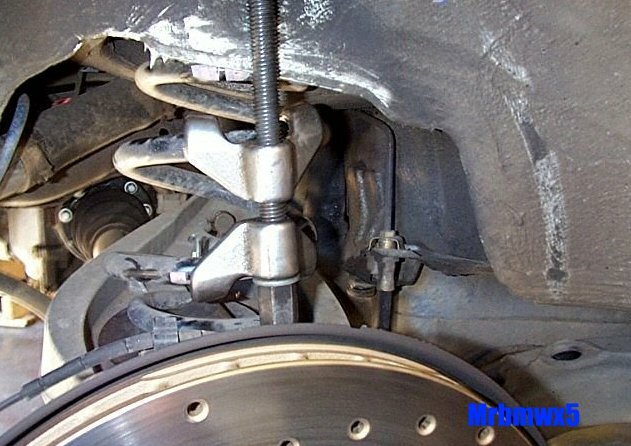 Once the shock is disconnected the control arm will drop several inches. 37. Disconnect the shock on the other side. 38. With both sides disconnected the springs can be pulled out. 39. Have one person push down on the control arm so a second person can pull the spring out. This is hard, using a broom handle or a bar to get leverage. 40. When you pull out the spring the rubber dampers may come out, if so reinsert them. 41. If you are installing H&R springs the rear springs are actually taller than the stock springs which makes it difficult to install. This make take several people pushing to get the spring in. Push push push on the control arm while someone slips the spring in. Make sure the spring properly seats on the rubber damping pads, otherwise the rear will not settle properly and be as high if not higher than stock. 42. The other side is considerable easier because the sway bar connecting both arms is helping to hold this side down. 43. Push down the control arm and sneak the spring in. 44. 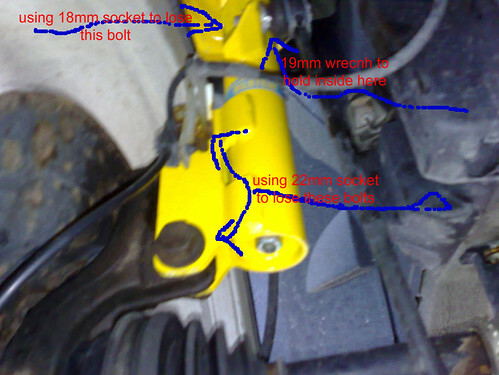 To reconnect the shock use a jack to lift up the control arm until till the shock and control arm line up. 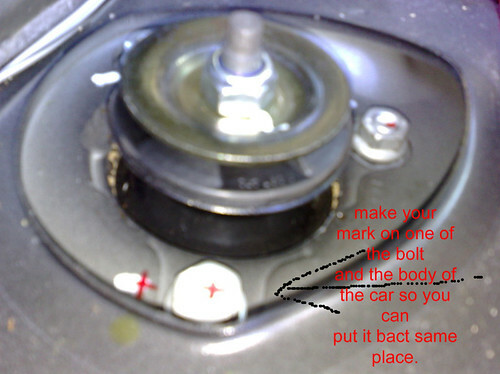 Bolt up the shock to the control arm, do the same for the other side. 45. With both shocks reconnected put the wheels back on and snug the lug bolts. 46. Raise the car, remove the jack stands and lower the car. 47. Tighten the lug bolts. The car may still look high because it was just lowered onto the tires. Pull the car forward a few feet and you should feel the rear drop considerable. Get out and admire how low your car looks, keeping in mind that depending on the springs your car may settle another half inch or so. Clean up the tools and you are done. Last edited by mrbmwx5; 08-09-2008 at 02:25 PM.